The new 9mm SR1911 is full of custom features. Ruger has been making 1911 pistols for several years, and their .45 ACP versions of the SR1911 have been recognized as high quality pistols featuring upgrades most often found on custom shop or after-market handguns. The SR1911 includes all of the operating features of a standard Colt Model 1911. This new SR1911 in 9mm is aimed at taking a slice of the market becoming more popular as the 9mm cartridge has seen a significant resurgence lately. 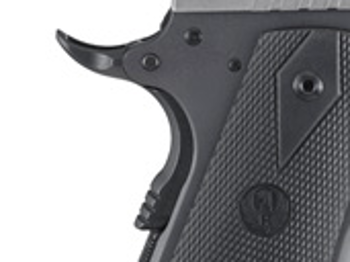 An extended beavertail grip safety provides enhanced grip during shooting. There is no doubt the venerable Model 1911 has been experiencing a huge influx of demand. The U.S. Marines Special Operations put down their Beretta M9’s briefly for the MARSOC 1911, before transitioning to the Glock 19. In a push back to the popularity of striker-fired, polymer framed pistols, there has been a significant minority of handgun enthusiasts that have rallied around the 1911 as the superior handgun. Ruger is willing to feed this group with a very nice 1911 option. Starting with a CNC-machined stainless steel barrel and bushing are made from the same bar stock, and on the same machine in what Ruger claims will produce superior accuracy. The slide and frame are also CNC-machined for greater detail and feature over less expensive forging. There is a positive barrel lock-up during firing to ensure accuracy out of the box. An oversized ejection port, and visual chamber inspection port are standard features on the SR1911. The Ruger 9mm SR1911 comes with an oversized ejection port to reduce the chances of stove-pipe failures. The 9mm SR1911 will have an extended magazine release for positive and faster manipulation. Skelotonized trigger and hammer reduce weight while providing a crisp, light trigger pull with short, positive reset. An oversized beavertail grip safety provides improved grip during rapid follow-up shots. The 3-dot Novak LoMount Carry sights are designed for concealed carry, while giving the shooter a decent sighting system. The thumb safety and slide stop are extended for greater manipulation. The skeletonized trigger reduces weight, and is designed for light pull and quick reset. 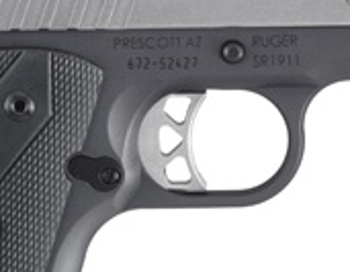 The SR1911 9mm will come with a visual inspection port to confirm chamber loaded status. Each 9mm SR1911 will come with (2) 9-round magazines, providing a fully loaded pistol with a 10-round capacity. Includes: Swaged link pin; titanium firing pin; (2) 9-round stainless steel magazines; and a bushing wrench. The new Ruger SR1911 Commander in 9mm, is much more than good looking. Law enforcement is no stranger to 1911 handguns (photo by fbi.gov). 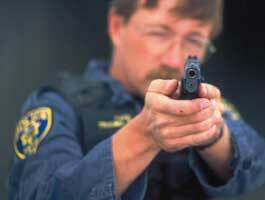 There are law enforcement agencies, and individual officers, already carrying a Model 1911 in various configurations. As the popularity of the design continues to grow there will likely be more agencies that consider or choose a 1911 model to carry. Many agencies will likely stay traditional, and select a model chambered in .45ACP. However, with the popularity and improved performance of the 9mm cartridge there will be a stronger push for pistols in this caliber. There are several benefits to 9mm. Modern advancements have vastly improved the performance of 9mm in FBI gelatin testing and even intermediate barriers. Being smaller reduces weight, but provides an opportunity for higher capacity. The SR1911 in 9mm has a 10-round capacity, which is 2-3 rounds greater than most .45 ACP 1911 models. In addition, 9mm ammunition is recognizably cheaper than .40 S&W and .45 ACP, allowing agencies to lower costs, and perhaps improve training. The features of the SR1911 greatly improve the overall performance of the 1911 pistol, and the 9mm is usually shot much better by a wide range of officer types, than .45 ACP. The Model 1911 is a very popular pistol design today, even over 100 years after its initial appearance. As more shooters are drawn to the design the discussion on duty and off-duty carry must consider the 1911’s presence. Though traditional 1911 shooters stick with the 7-round (occasionally 8-round) .45 ACP models, most in law enforcement would not recognize the capacity as sufficient for potential deadly threat confrontations. However, the 9mm SR1911 has a 10-round capacity that could meet minimal expectations for capacity. The SR1911 Commander is a compact version of the original 1911 design, providing greater potential for both on-duty and off-duty carry. This new Ruger pistol is probably a bit too large for a back-up pistol, but it is not outside the possibility. The price of the 9mm SR1911 is one of the biggest drawbacks, as many agencies are able to buy quality striker-fired pistols for half as much as the SR1911. However, for the features included on the SR1911 9mm, the price is very reasonable in the 1911 world. The other drawback is the Novak 3-dot white sights. These are quality sights – for range shooting, however a police agency will have to upgrade to some form of night sights. This added expense will likely push the SR1911 out of contention. We have not had the opportunity to shoot the new 9mm SR1911, but the design features and quality appear to be top-notch. 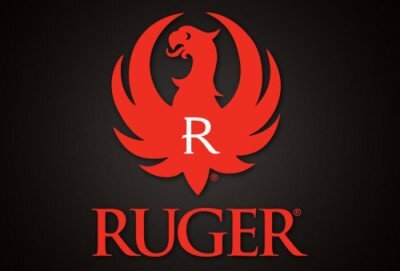 Ruger has been on fire over the last 5-6 years, selling millions of firearms each year. 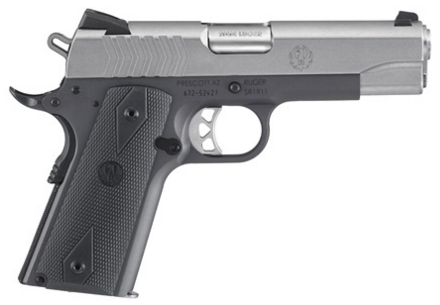 It goes to stand that this new SR1911 will perform with the quality expected of Ruger products. I recently purchased this gun and it is amazing. I love the light trigger pull and the ease of pulling the slide back. Wife was even able to pull it back. I know for u strong young guys it is not a problem but I am pushing 60 and hands are not nearly as strong as they once were. Thanks for the article and stay safe out there my friend. Great to hear Rusty, thanks for reading and taking the time to provide some firsthand feedback to our readers!